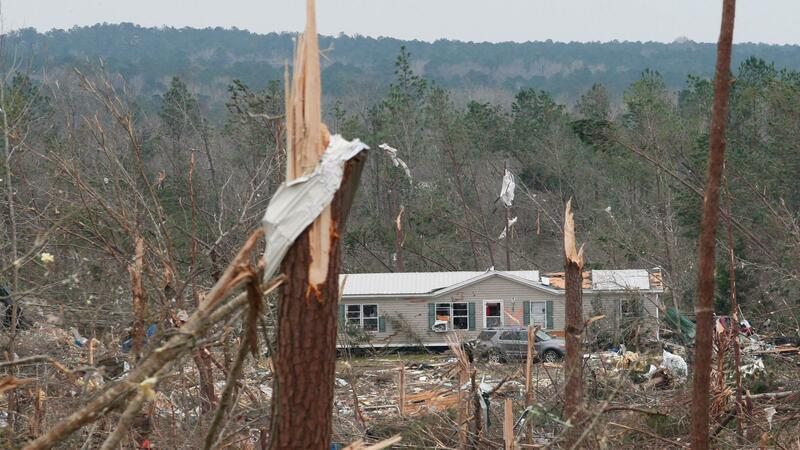 A tornado-damaged house is seen March 4 in Beauregard, Ala. Rescuers in Alabama were set to resume search operations Monday after tornadoes killed 23 people, uprooted trees and caused "catastrophic" damage to buildings and roads. "The devastation is incredible," Lee County Sheriff Jay Jones told the local CBS affiliate late Sunday. Rescuers in eastern Alabama combed through the debris from homes ripped apart by powerful tornadoes that swept through the area on Sunday, killing at least 23 people. Lee County Sheriff Jay Jones confirmed to media outlets Sunday the number of dead. He told The Associated Press late Sunday evening that children are among the dead, and that it is possible that the death toll could continue to rise. Lee County is located in the east central part of the state, along the border with Georgia. The AP said that at least one tornado traveled "straight down a county road, the twister carved a trail of destruction at least half a mile wide and about a mile long Sunday, overwhelming the Lee County coroner's office, which was forced to call in help from the state." On Monday, President Trump said he had spoken to Alabama Gov. Kay Ivey about the "historic" tornado. He said that the Federal Emergency Management Agency was "in full force" to help out. Sheriff Jones told local CBS station WRBL-TV that the damage in his community trailed several miles long and about 1/4 of a mile wide. Some people transported to the hospital sustained "very serious injuries," he added. Officials with the county's Emergency Management Agency say they are in "search and rescue mode," reports Miranda Fulmore of Birmingham member station WBHM. The National Weather Service says, according to Fulmore, that crews from Jefferson County will head to Lee County early Monday to survey the damage. John De Block, a warning coordination meteorologist with NWS Birmingham, tells Fulmore that the storm's EF3 strength level can bring wind speeds of up to 165 miles per hour. 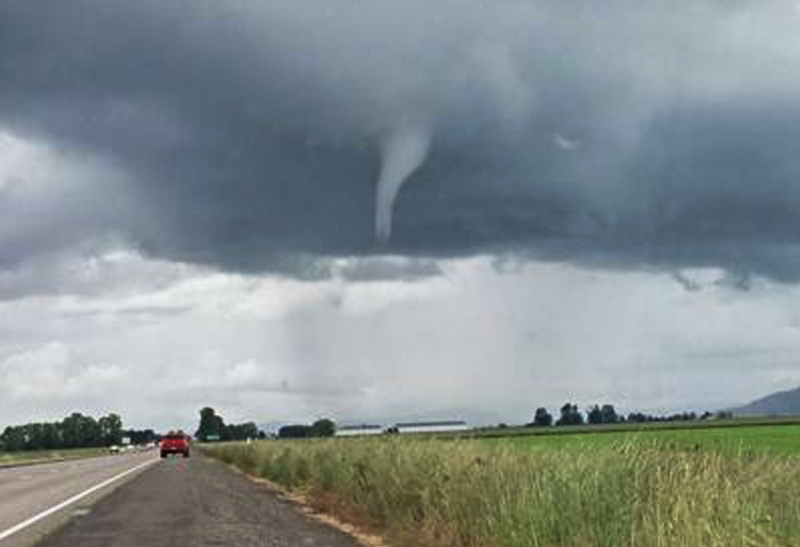 A funnel-shaped cloud near Marianna, Fla., on Sunday. Numerous tornado warnings were posted across parts of Alabama, Georgia, Florida and South Carolina on Sunday afternoon as the powerful storm system raced across the region. NWS also confirmed to Fulmore that, in addition to two tornadoes in Lee County, tornadoes hit Russell, Macon and Barbour Counties. Earlier Sunday, the service had issued a series of tornado warnings extending about 100 miles to the east, from Phenix City, Ala., to Macon, Ga.
On Twitter, the Lee County sheriff's office pointed people to the Red Cross to locate loved ones who might be missing. Ivey said on Twitter that she would extend the current state of emergency to free up resources for areas impacted by Sunday's severe weather. "Our hearts go out to those who lost their lives in the storms that hit Lee County today," Gov. Ivey tweeted. "Praying for their families & everyone whose homes or businesses were affected." On Sunday night, the president also tweeted to Alabama residents. "To the great people of Alabama and surrounding areas: Please be careful and safe. Tornadoes and storms were truly violent and more could be coming," Trump wrote. "To the families and friends of the victims, and to the injured, God bless you all!"